Making a gift through your employer’s workplace giving campaign is a simple way to help vulnerable children and their families defeat hunger. Many companies will even match your donation, doubling or tripling the impact of your gift! This benefit is very fulfilling and you won’t even feel the pinch from your paycheck. Yet, at the end of the year, every penny is tax deductible and can make a big difference in your annual IRS tax filing. Your gift to Feed the Children could help twice as many hungry children. Currently, 23,000 employers offer matching gift programs that double or even triple charitable contributions made by their employees. Some companies even match gifts made by retirees and/or spouses, too. And many employers also offer volunteer matching programs that match employee volunteerism with corporate donations! For every dollar you give, you’re really giving two dollars. To find out if your company matches gifts, use the convenient search tool below or ask your human resources or community relations department — they’ll be able to give you the details. 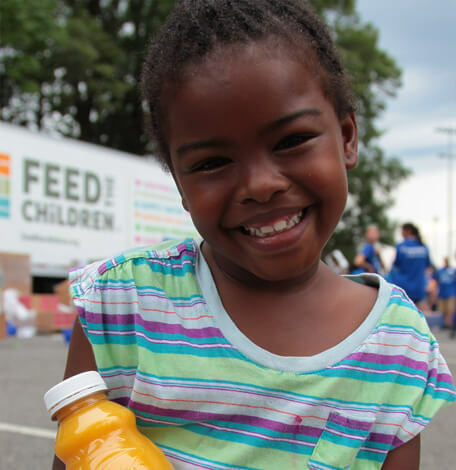 Feed the Children works hard to ensure every dollar is used wisely to accomplish the most good. 93% of Feed the Children's expenditures in FY 2017 went to program services. Approximately 4 million federal employees are solicited annually throughout the United States and overseas to donate to eligible non-profit organizations that provide health and human service benefits throughout the world. The campaign’s season is generally, Sept. 1 through Dec. 15. Check with your agency for exact dates for any given year. Feed the Children’s CFC number is #10986. 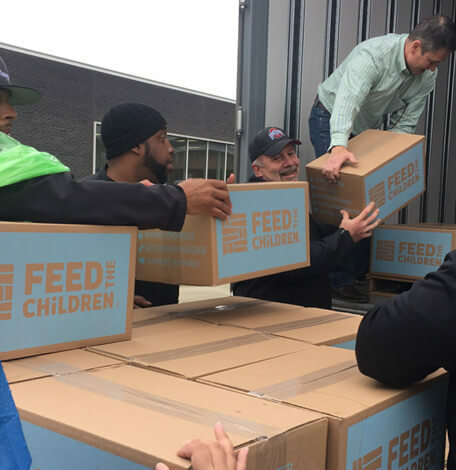 Feed the Children participates in numerous state, county, and municipal employee campaigns. Check your campaign brochure to see if Feed the Children is an option. 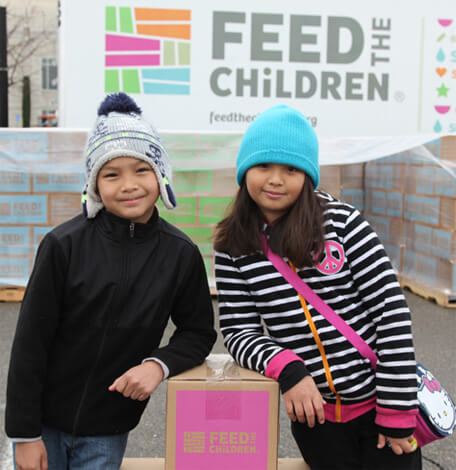 Feed the Children is also a choice in the workplace giving campaigns of more than 100 companies across the country. Look for us in your employer’s workplace giving campaign or ask your human resources department how to write us in. Many United Way campaigns offer a “write-in” option. Please write in the complete name – Feed the Children, Tax ID/EIN 73-6108657. United Way campaigns vary in their processes and in rules governing the distribution of donations within each local or regional campaign. Check with your Human Resource department for clarification. 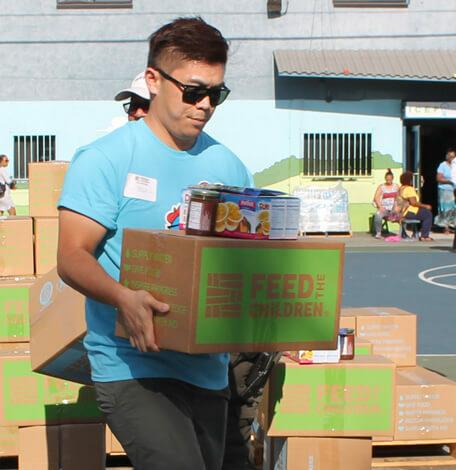 Feed the Children can participate in your workplace giving event, charity fair or kick-off. Please email workplace.giving@feedthechildren.org to make arrangements. Workplace Giving provides a powerful incentive for your business and its employees to join together to defeat childhood hunger. It sends employees a clear message that your company is invested in children and your community. If your company does not have a workplace giving program, please ask your employee benefits director to contact America’s Charities at 800-458-9505 or visit their website at www.charities.org for more information.